Caleb Wiles Joins Conjuror Community! Caleb Wiles is a creator, a theorist and has a deep love for puzzles. He has referred to himself as “the puzzle master magician” and when you watch Caleb performing, you understand just how brilliant he really is! Caleb also creates amazing card magic that astonishes everyone who sees it—magicians and laymen alike. That’s why we are so proud to announce that Caleb Wiles is joining Conjuror Community for an intimate event… right in his home… for a secret session that’s guaranteed to astonish you! Join Live on Wednesday, May 16th...or watch anytime! Right now, you can get a full month of Conjuror Community—including Caleb Wiles CC Living Room Lecture—for just $1. Escalate Stage-By-Stage Into Miracles – stacking surprise on surprise, each more amazing than the last than the last—so your audience is so astonished, they never see the ultimate surprise coming..until it’s too late! Astonish Anyone at Any Time – Whether your audiences are watching you perform live, or on TV—Caleb’s miracles will blow their minds. Automate the Awesome – Caleb’s miracles won’t break your knuckles. That means you can focus on the fun part—amazing your audiences with incredible magic. For this Special CC event, Caleb is only bringing the BEST of the BEST. We’re calling this event TKO (Technical Knockout), because for this Living Room Lecture, Caleb has selected only astonishing routines that require little or no sleight-of-hand. You’ll discover amazing routines that are EASY to do—so you’ll be guaranteed to astonish even your toughest crowd! Fully Automatic Card Trick – Every detail of the blockbuster, self-working trick Caleb performed on Penn & Teller’s Fool Us! Caleb will take you ‘behind the scenes’ of his show stopping performance—and you’ll discover a self-working miracle that thrilled a national TV audience (not to mention Penn and Teller!). Automatic Mind Reading! – This simple miracle has amazed some of the smartest card workers in the world. It actually feels like REAL mindreading—and best of all, it’s completely automatic! Television Telepathy – ANOTHER automatic miracle that devastates magicians and the public alike. When was the last time you saw a self-working card trick so powerful that it works on TV? 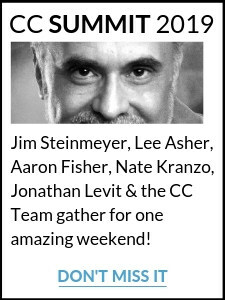 Get ready to be astonished. Clue – As you’ll discover, Caleb has the rare ability to see new potential in the most unlikely places. Get ready to discover an amazing principle you may already think you know—but you’ve NEVER seen it like this. 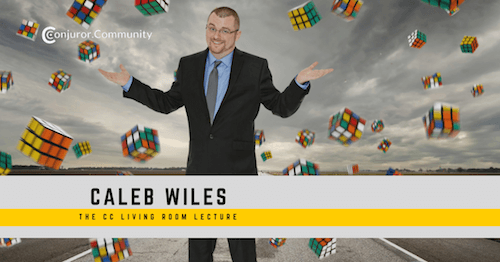 And that’s just the beginning of what you’ll discover in TKO – The Caleb Wiles CC Living Room Lecture! We are proud to welcome Caleb Wiles to the CC Family!